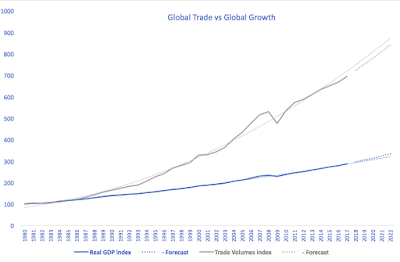 28/10/17: Trade vs Growth or Trade & Growth? Much has been written down recently about the dramatic slowdown in growth in global trade flows. For example, after rebounding post-Global Financial Crisis (global trade volumes fell 10.46% in 2009) in 2010-2011 (rising 12.52% and 7.1% respectively), trade volumes growth slowed to below 4% per annum in 2012-2016, with 2017 now projected to be the first year of above 4% growth in trade (4.16%). 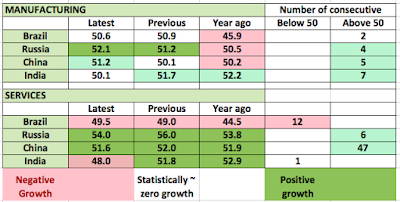 This has prompted many analysts and academics to define the current recovery as being, effectively, trade-less growth (see, for example https://www.bis.org/review/r161125c.pdf). Instead, what really happened to the two series that both real GDP growth and trade volumes growth have fallen significantly since 2011. Average growth in trade over 1980-2017 period stood 2.31 percentage points above growth in real GDP. The 2010-2017 period average gap between the two is 1.78 percentage points, the second lowest decade average after 1.48 percentage points gap recorded in the 1980s. However, these comparatives are somewhat distorted by influential outliers - years when post-recessions recoveries triggered significantly higher spikes in growth in both series, and years when trade recessions were substantially sharper than GDP growth slowdowns. Omitting these periods from decades averages, as the chart above illustrates, makes the current recovery (2010-2017 period) look much much worse than any previous decade on the record (green dashed lines). 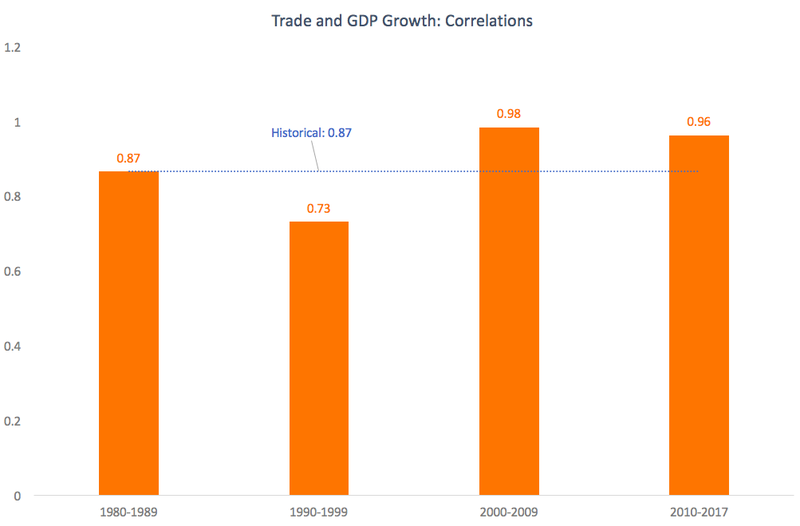 In fact, correlation between trade growth and GDP growth is currently (2010-2017 period) running at an extremely high levels of 96%, compared to historical correlation (1980-2017) of 87% and compared to pre-2010 average (1980-2009) of 88%. So what has been happening, thus? As the chart above clearly shows, there are significant differences in trends between the two series. 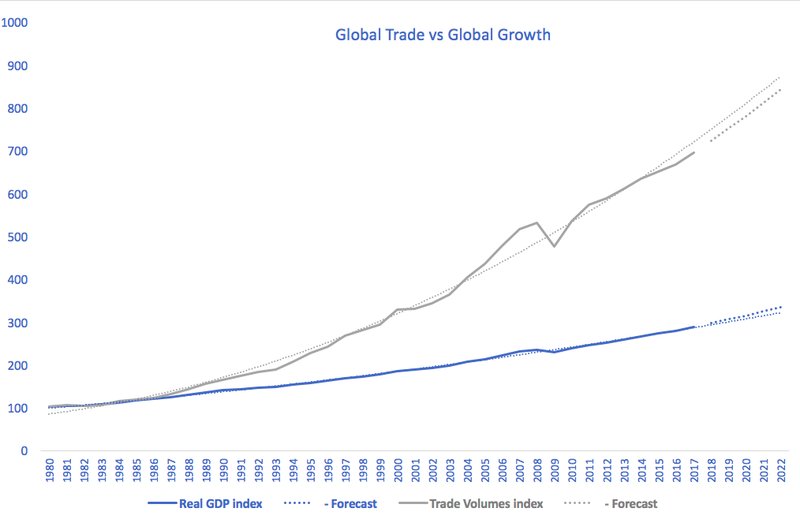 Using indexing approach, setting 1979 = 100, we can compute index of real GDP activity and trade volumes activity based on annual rates of growth. The two series exhibit a diverging pattern, with divergence starting around the end of the 1980s, accelerating rapidly during 1993-2008 period and then de-accelerating since the onset of the post-GFC recovery. Notably, however, this de-acceleration simply slowed the expansion of the gap between the two series, and it did not reverse it or close it. Currently, global GDP growth is just above the long-term trend. But global trade growth has been running below its historical trade since 2014. 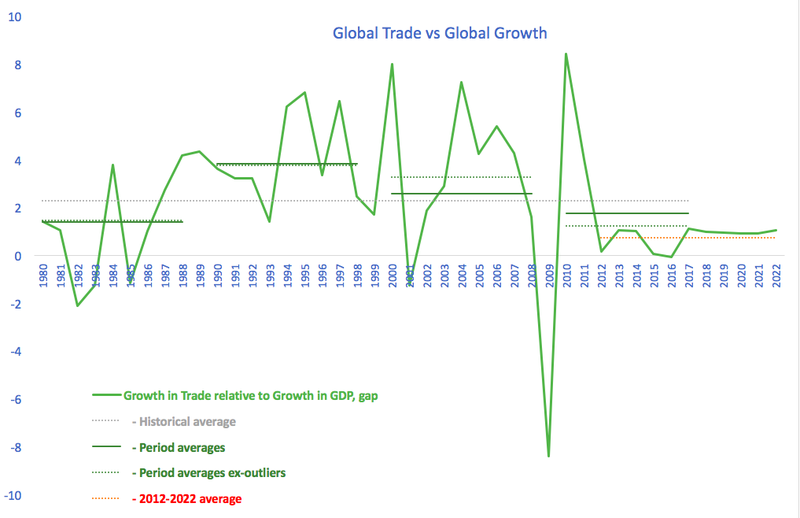 Back in 2004-2008 period, rate of growth in global trade vastly exceeded its trend. Why? 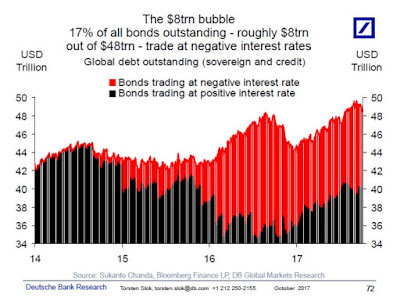 Because 2004-2008 period was the period of rapidly inflating real assets bubbles around the globe - the period of ample credit and ample demand for investment goods and raw materials. Similar logic applies to 1994-2000 period of In other words, the glorious days of global trade expansion, the period of accelerated growth in trade. In other words, past periods of exploding trade volumes growth are unlikely to reflect sustainable trends in the real economy. 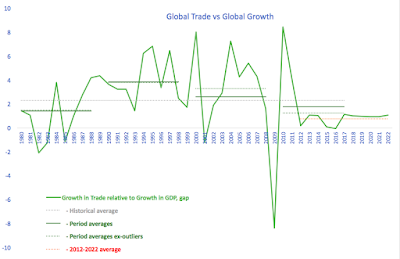 These were the periods of substantial misalignment between trade and growth much more than the current period of slower trade growth suggests. In other words, something is happening to both trade and growth, and that, most likely, is what we call a structural slowdown or a secular stagnation. My take on ECB's latest policy announcements for the Sunday Business Post: https://www.businesspost.ie/opinion/supplies-monetary-methadone-will-continue-401179. The differences between two generations, controlling for age, are striking. In my opinion, the dramatic increase in income inequality across two generations in the majority of OECD economies (caveats to Ireland and Greece dynamics, and a major outliers of Switzerland, France and the Netherlands aside) is one of the core drivers for changing perceptions of the legitimacy of the democratic ethics and values when it comes to public perceptions of democracy. You can read more on the latter set of issues in our recent paper, here: http://trueeconomics.blogspot.com/2017/09/7917-millennials-support-for-liberal.html. 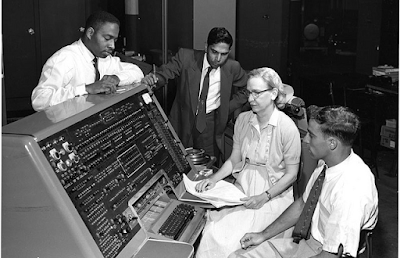 In other words, where as in the 1950s it was sufficient to have a job to gain a place on a social progression ladder, today younger workers need to have the job (at Google, or Goldman Sachs, or other 'star' employers) to achieve the same. 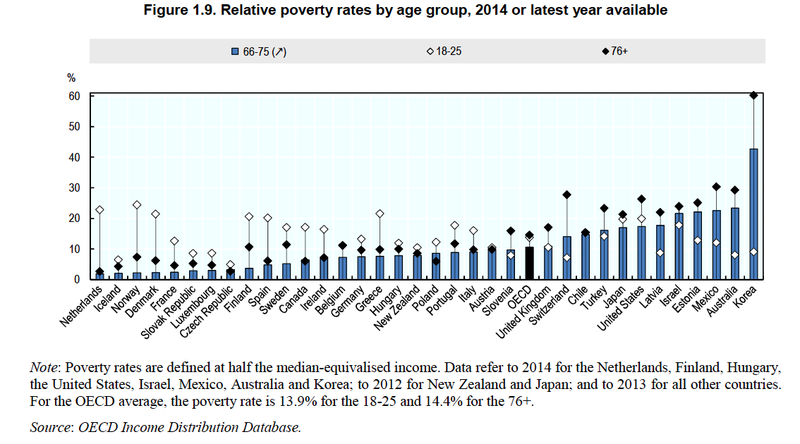 In 25 OECD countries out of 35, poverty rates for those aged 18-25 are today higher than for those of age 65-75. 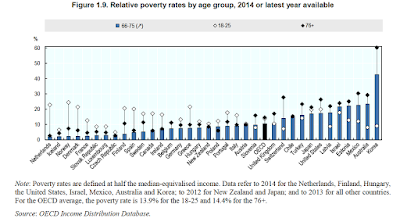 Across the OECD, statistically, poverty rates for the 18-25 year olds cohort are on par with those for of 76+ year olds cohort, and both are above 12 percent. There is a lot that is still missing in the above comparatives. For example, the above numbers do not adjust for differences between different age groups in terms of quality of health and education. Younger workers are also healthier, as a cohort, than older population groups. This means that their incomes should be expected to be higher than older workers, simply by virtue of better health. 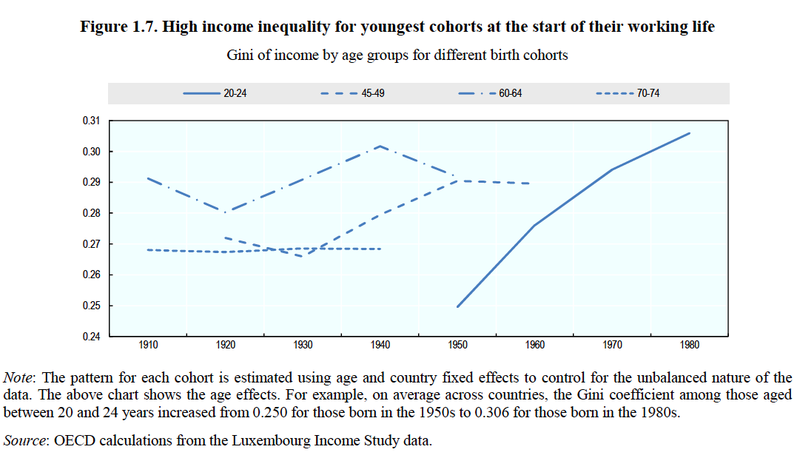 Younger workers are also better educated than their older counterparts, especially if we consider the same age cohorts for current Millennials and the Baby Boomers. 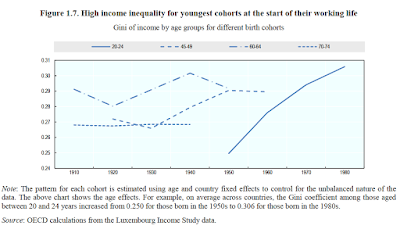 Which also implies that their incomes should be higher and their income inequality should be lower than that for the Baby Boomers. 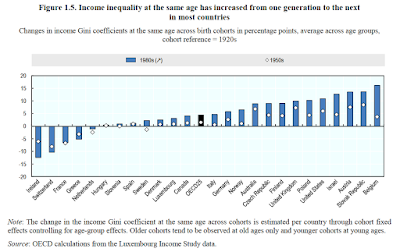 In other words, simple comparatives under-estimate the extent of income inequality and poverty incidence and depth for the Millennials by excluding adjustments for health and education differences. 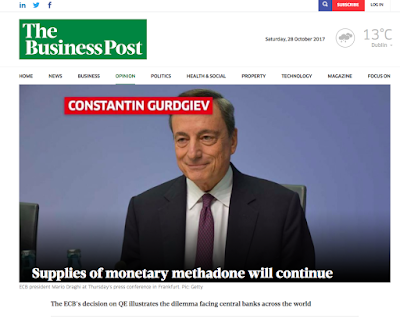 Having just written about the Czech electoral pivot toward populism last night, today brings yet another news headline from the politically-hit Europe. In a non-binding referendums in two wealthiest Italian regions, Veneto and Lombardia, the voters have given local governments strong mandates to push for greater autonomy from Rome and the Federal Government. Both regions are dominated by the politics of Lega Nord, a conservative, autonomy-minded party with legacy of euro scepticism, strong anti-immigration sentiment and the past promotion of outright independence for the Northern Italy. In both referendums, turnout was relatively strong by Italian standards (58% projected for Veneto and over 40% for Lombardia). And in both, exit polls suggest that some 95% of voters have opted for stronger regional autonomy. The referendums were not about outright independence, but about wrestling more controls over fiscal and financial resources from Rome. Both regions are net contributors to the Italian State and are full of long run resentment over the alleged waste of these resources. Both regions want more money to stay local. In reality, however, the vote is about a combination of factors, namely the EU policies toward Italy, the monetary conditions in the euro area, the long-term stagnation of the Italian economy and the centuries-old failure of Italian Federal State to reform the economy and the society of the Southern Italian regions. Italy today is saddled with stagnation, huge youth unemployment, lack of business dynamism, weak entrepreneurship, dysfunctional financial institutions, high taxes, failing and extremely heterogenous public services, collapsed demographics and centuries-old divisions. Some of these problems are european in nature. But majority are Italian. Greater autonomy for wealthier regions, in my view, is a part of the solution to the long running problems, because it will create a set of new, stronger incentives for the Southern regions to reform. But in the end, it is hard to imagine the state like Italy sustaining its membership in the euro area without an outright federalization of the EU. In the nutshell, within a span of few weeks, the dormant political volcano of the Europe has gone from stone cold to erupting. Spain, Austria, Czech, & Italy are in flames. Late-stage lava flows have been pouring across Poland, Hungary and the UK, Slovakia and parts of the Baltics for months and years. Tremors in Belgium, the Netherlands, Germany, (especially Eastern Germany) and Finland, as well as occasional flares of populist/extremist activity in other parts of the Paradise are ongoing. And, it is only a matter of time before populism resurges in France. The importance of the Google DeepMind's AlphaGo Zero AI program is not that it plays Go with frightening level of sophistication. Instead, it true importance is in self-sustaining nature of the program that can learn independently of external information inputs, by simply playing against itself. In other words, Google has finally cracked the self-replicating algorithm. Yes, there is a 'new thinking' dimension to this as well. Again, quoting from The Atlantic: "A Go enthusiast named Jonathan Hop ...calls the AlphaGo-versus-AlphaGo face-offs “Go from an alternate dimension.” From all accounts, one gets the sense that an alien civilization has dropped a cryptic guidebook in our midst: a manual that’s brilliant—or at least, the parts of it we can understand." But the real power of AlphaGo Zero version is its autonomous nature. From the socio-economic perspective, this implies machines that can directly learn complex (extremely complex), non-linear and creative (with shifts of nodes) tasks. This, in turn, opens the AI to the prospect of writing own code, as well as executing tasks that to-date have been thought of as impossible for machines (e.g. combining referential thinking with creative thinking). 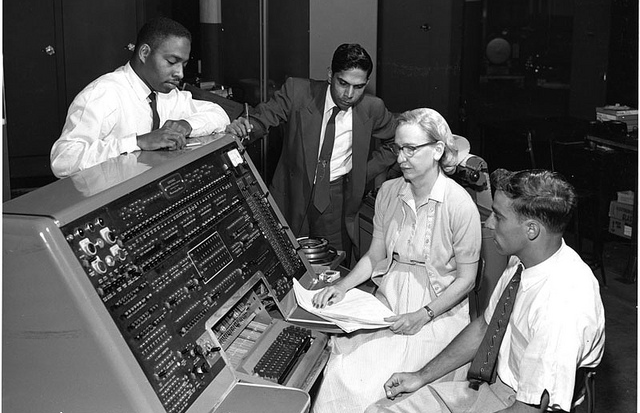 The idea that coding skills of humans can ever keep up with this progression has now been debunked. Your coding and software engineering degree is not yet obsolete, but your kid's one will be obsolete, and very soon. Welcome to the AphaHuman Zero, folks. See yourself here?.. A great post highlighting the impact of framing on our perception of reality: https://fat-pitch.blogspot.com/2017/10/using-time-scaling-and-inflation-to.html. The chart on the left shows nominal index reading for S&P500. The one on the right shows the same, adjusted for inflation and using log scale to control for long term duration of the time series. In other words, both charts, effectively, contain the same information, but presented in a different format (frame). 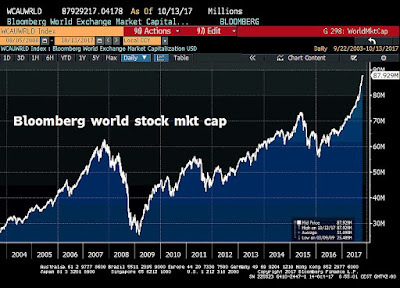 Rob Shiller recently waxed lyrical about the fact that - by his own metrics - the markets are overpriced, yet no crash is coming because there is not enough 'leverage in the system' to propagate any shocks to systemic levels. CAPE is defined by dividing the S&P 500 index by the 10-year moving average of index components' earnings. The long-run average of CAPE is 16, and the index currently sits above 31, making the current markets valuations trailing those of the dot.com bubble peak (using recent/modern comparatives). So the markets are very expensive. But what Shiller says beyond this mechanical observation is very important. His view is that these levels of valuations are 'sustainable' in the medium term because there is very little leverage used by investors in funding these levels of stock prices. In the nutshell, this says that if there is any major correction in the markets, investors are unlikely to be hit by massive margin calls, triggering panic sell-offs. So any correction will be short-lived and will not trigger a systemic crisis. All fine with the latter part of the argument, if we only look at the stock market brokerage accounts leverage, ignoring other forms of leverage. And we can only do this at a peril. Investor is a household. Even an institutional one, albeit with a stretch. When asset prices correct downward, income received by investors falls (dividends and capital gains are cut) and investor borrowing capacity falls as well (less wealth means lower borrowing capacity). But debt levels remain the same. Worse, cost of funding debt rises: as banks and other financial intermediaries see their own assets base eroding, they raise the cost of borrowing to replace lost income and capital base with higher earnings from lending. Normally, the Central Banks can lower cost of borrowing in such instances to compensate for increased call on funds. But we are not in a normal world anymore. Meanwhile, unlike in the dot.com bubble era, investors/households are leveraged not in the investment markets, but in consumption markets. Debt levels carried by investors today are higher than debt levels carried by investors in the dot.com and pre-2007 era. And these debts underwrite basics of consumption and investment: housing, cars, student loans etc (see https://www.bloomberg.com/view/articles/2017-10-18/don-t-rely-on-u-s-consumers-to-power-global-growth). Which means that in an event of any significant shock to the markets, investors' debt carry costs are likely to rise, just as their wealth is likely to fall. This might not trigger a market collapse, but it will push market recovery out. An added leverage dimension ignored by Shiller is that of the corporates. During the crises, cash-rich and/or liquid corporates can compensate for falling asset prices by repurchasing stocks. But corporates are just now completing an almost decade-long binge in accumulating debt. 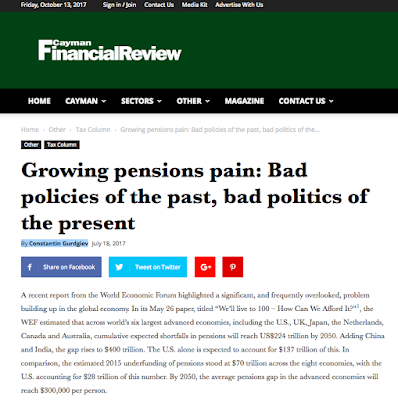 If the cost of debt carry rises for them too, they will be the unlikely candidates to support re-leveraging necessary to correct for an adverse asset prices shock. I would agree with Shiller that, given current conditions, timing the markets correction is going to be very hard, even as CAPE indicator continues to flash red. But I disagree with his view that only margin account leverage matters in propagating shocks to a systemic level. 22/10/17: Oh my... Germany Looks Like Japan ca 2000-2001? An adjustment for institutional structures (e.g. greater openness to migration). 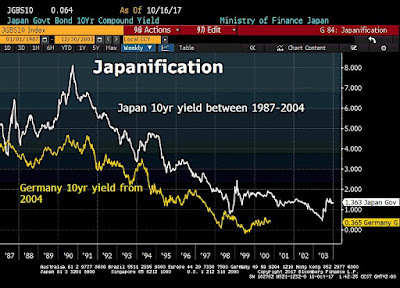 These are reflected in the distance between the German yields today and the Japanese yields in the 1990s and 2000s. 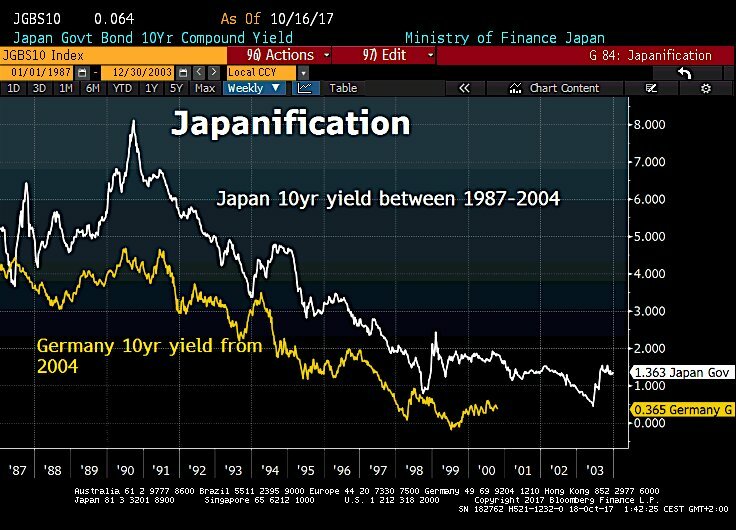 That distance, of some 1,000 basis points, is material to the debt carry capacity (meaning Germany has much greater borrowing capacity than Japan had back in the early 2000s). But it is also more uncertain, as ECB monetary policy cannot fully converge to the German conditions alone (it can be dominated by these conditions for quite a long while, but neither perpetually, nor fully). Just after Austria, the Czech Republic too has swung decisively in the direction of embracing populism as Populist billionaire's Eurosceptic party wins big in Czech Republic. As Radio Praha describes it: "The Czech Donald Trump or Silvio Berlusconi, maverick millionaire, political populist, mould breaker; these are all labels that have been tagged on to ANO leader Andrej Babiš". Jakub Patocka for the Guardian: "Open racism has become a normal part of public discourse. Trust in democratic institutions and the European Union has been crumbling before our eyes. It is shocking how easily and quickly this has happened. Many Czechs are going to the polls with grim fears for the future. A broad coalition of democratic parties is not likely to have enough votes to control parliament. Apart from the far right, communists and a peculiar Czech version of the Pirate party are expected to do well." The headlines from Prague are sounding more like something the 'Kremlin-backed' news outlets would produce. Except, they are printed by the mainstream international media this time around. But things are much worse than Babis and ANO victory and 29.8 percent of the vote implies. Four out of top five parties by voting results are now parties with populist leanings, far removed from the traditional Czech elites. The mainstream opposition conservative party, the Civic Democrats, are now a distant second with only 11.2 percent of the vote. 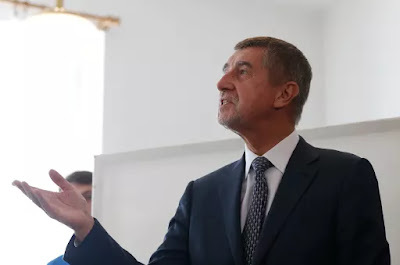 Czech Republic's "most radical anti-migration, anti-Islam and anti-EU party, Freedom and Direct Democracy", came in the third place with 10.8 percent of the vote, statistically indistinguishable from the Civic Democrats. Another populist party - the Pirate party - is on 10.6 percent with a Parliamentary representation for the first time in its history. And the Communists got 7.9 percent. In simple terms, more than 59 percent of the voters have gone either extreme Left or extreme Right of the Centre, and backed populist politics. In a recent paper, we explain how the trends amongst younger voters around the world are shifting away from support for liberal democratic values. These shifts are now starting to translate into votes. A top-level, comprehensive report compiled by the Lancet Commission details estimates of economic and human costs of pollution worldwide. 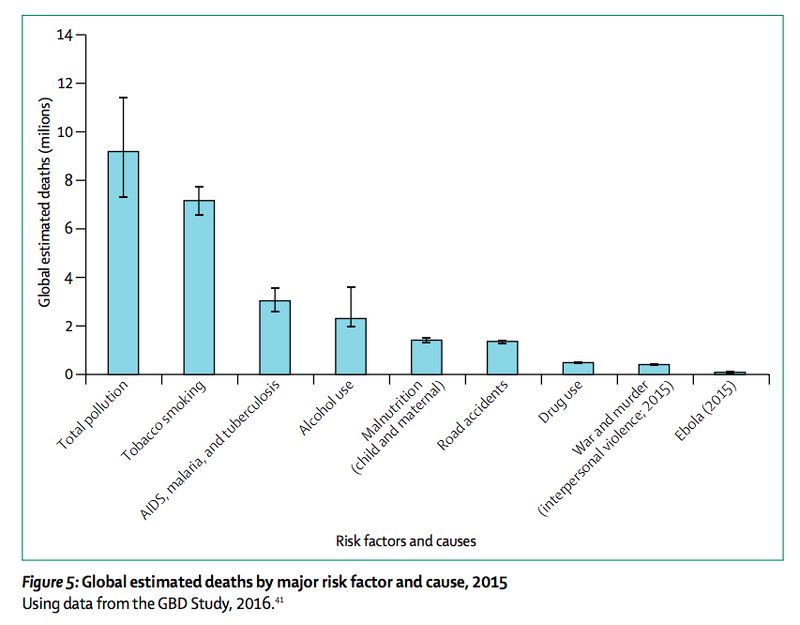 The full report is available here: http://www.thelancet.com/commissions/pollution-and-health. Incidences of pollution impacts are bound to be concentrated in the areas where other factors (e.g. poverty, location of extraction industries, etc) are also at play. In emerging economies, pollution related health and life costs are resulting in a labour productivity decline that accounts for the reduction in potential economic output of around 1-2 percent of GDP annually. And this is only due to productivity declines. "Pollution is the largest environmental cause of disease and premature death in the world today. 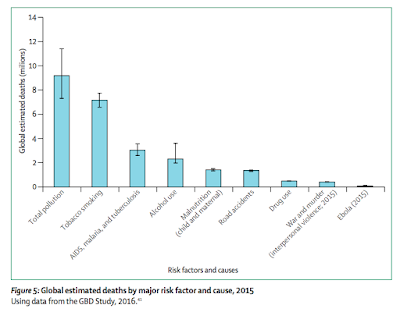 Diseases caused by pollution were responsible for an estimated 9 million premature deaths in 2015—16% of all deaths worldwide — three times more deaths than from AIDS, tuberculosis, and malaria combined and 15 times more than from all wars and other forms of violence. In the most severely affected countries, pollution-related disease is responsible for more than one death in four. 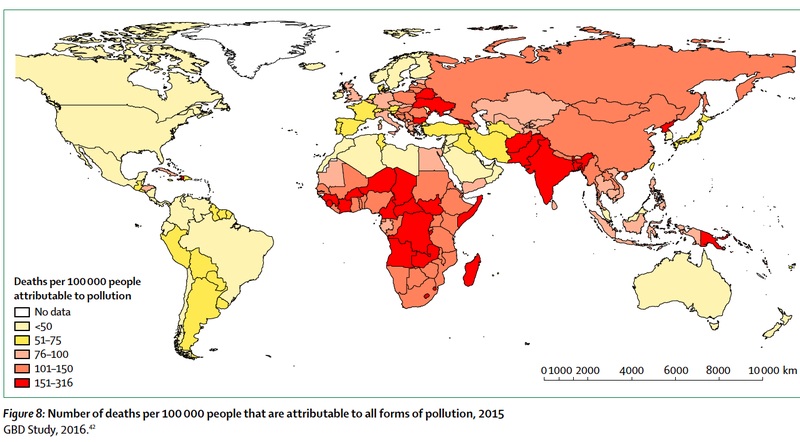 Pollution disproportionately kills the poor and the vulnerable. 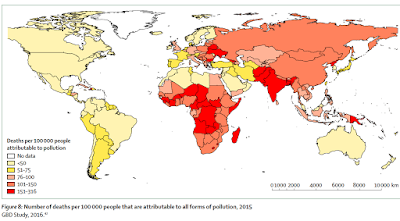 Nearly 92% of pollution-related deaths occur in low-income and middle-income countries and, in countries at every income level, disease caused by pollution is most prevalent among minorities and the marginalised. Children are at high risk of pollution-related disease and even extremely low-dose exposures to pollutants during windows of vulnerability in utero and in early infancy can result in disease, disability, and death in childhood and across their lifespan." This is a very important report, worth reading. If you have a job structuring and selling, marketing and monitoring/managing car insurance contracts, you should stop reading this now... because, Intel has developed the first set of algorithmic standards for self-driving vehicles that aim to ensure that any accident involving a self-driving vehicle cannot be blamed on the software that operates that vehicle. How? Read some scant details here: https://www.bloomberg.com/news/articles/2017-10-18/intel-proposes-system-to-make-self-driving-cars-blameless. What does this mean? If successful, regulating algorithmic standards, most likely more advanced than the one developed by Intel, will mean that self-driving vehicles collision will be by system definition blamed only on human drivers, bicyclists and pedestrians. Which will, de facto, perfectly standardise all insurance contracts covering vehicles other than those operated by people. 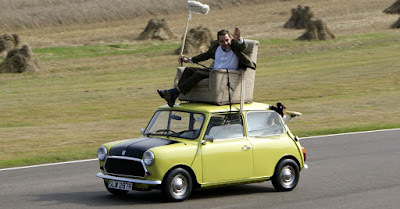 The result will be rapid collapse in demand for car insurance as we know it. Instead of writing singular (albeit standardised) contracts to cover individual drivers (or vehicles driven by them), using actuarial risk models that attempt to identify risk profiles of these drivers, insurance industry will be simply writing a single contract to cover software running millions of vehicles, plus a standard contract to cover the vehicle (hardware). There will be no room left for profit margins or for service / contract differentiation or for pricing variation or for bundling of offers. In other words, there will be no need for all the numerous marketing, sales, investigative, enforcement, actuarial etc jobs currently populating the insurance industry. Car insurance sector will simply shrink to a duopoly (or proximate) providing cash management service to autonomous vehicles owners. 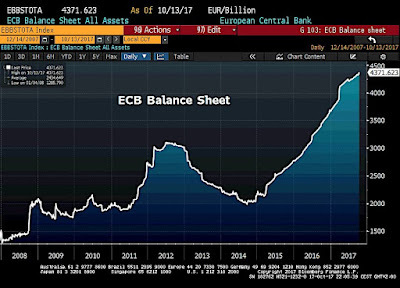 ECB (world's largest holder of Government junk err... debt... err assets...) has ramped up its QE purchases by EUR34 billion, reaching the new historical high of EUR4.371 trillion. Currently, ECB asset holdings amount to 40.5 percent of the euro area GDP. Of course, much of this 'purchasing' goes to fund fiscally insolvent 'austerity' implementing Governments of Europe (with exception of Greece). Courtesy of the above blue mountain, majority of European Governments today can avail of the negative yielding money from 'the markets'. The years of forward forecast are, allegedly, the years of QE unwinding. This debt bubble is a money-printing bubble which is a Keynesian Government 'stimulus' bubble. Look at the above. QED. And, if you have not reaped its upside, you will pay its downside. Now, check your pockets. Austria just became a *new* flashpoint of European politics that can be best described as a slow steady slide into reappraisal of the decades-long love affair with liberalism. In summary: the People's Party (OVP) has 31.4 percent of the vote, a gain of more than 7 percentage points from the 2013 election; the Freedom Party had 27.4 percent (a jump on 20.51 percent in 2013), and the Social Democratic Party, which governed in coalition with People's Party until today, had 26.7 percent (virtually unchanged on 26.82 percent in 2013). The People's Party is best described as Centre-Right with a leaning Right when it comes to issues of immigration. Current Foreign Minister Sebastian Kurz, the leader of the People's Party is a charismatic 31-year old populist. He has driven his party further toward the Right position in recent months, as elections neared, and away from his post-2013 governing coalition partners, the Social Democrats. Kurz is, broadly-speaking a pro-EU candidate, with strong preference for more autonomy to member states. He is clearly not a Brussels-style Federalist. 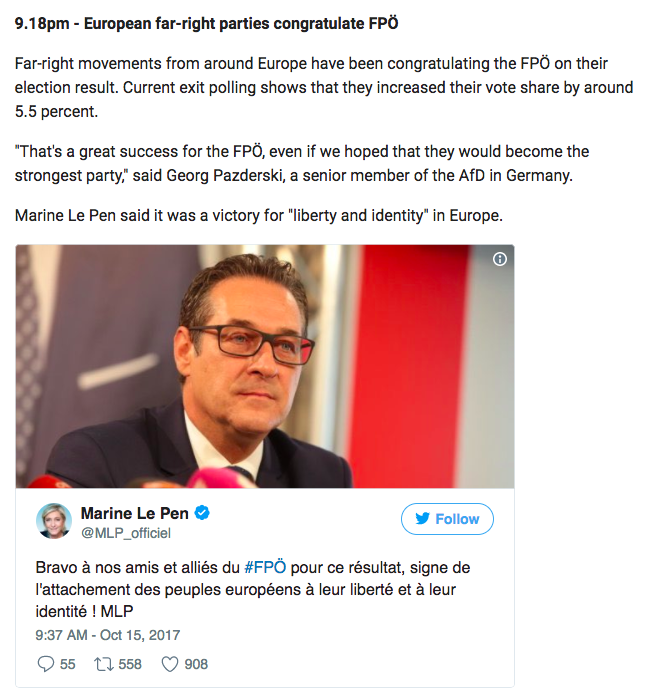 The Freedom Party (FPO) was close to its record vote of 26.9 percent, achieved back in 1999, and now has a good chance of entering the government as a coalition partner to People's Party, for the first time in some 10 years. 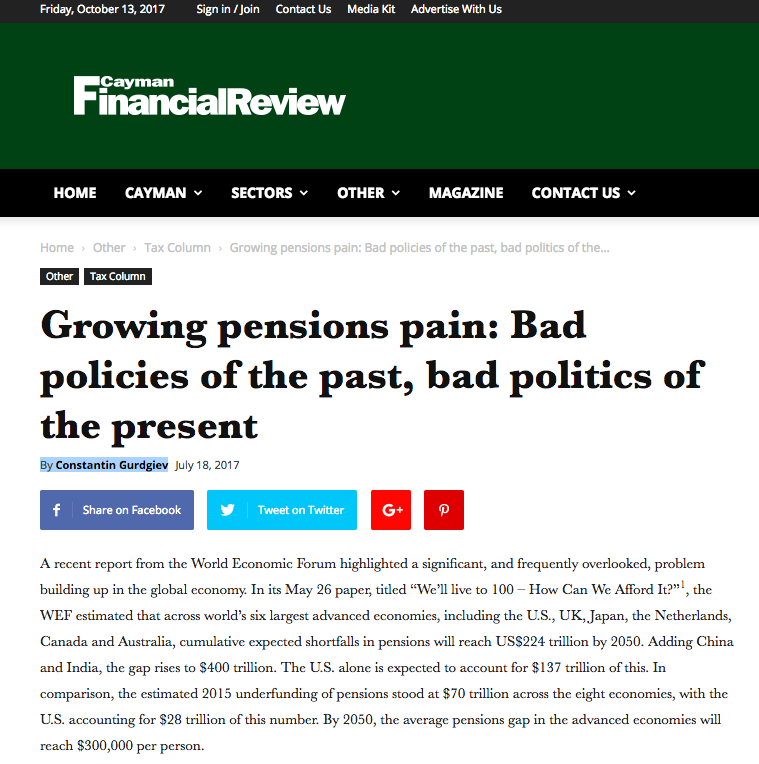 The FPO was in Government last in 2000-2007 and prior to that in 1983-1987. It's last stint in Government earned Austria condemnation from the EU. Following the previous coalition, the OVP and the Social Democrats are not exactly best friends, which means that FPO is now in the position of playing a king-maker to the Government. That said, the coalition between OVP and FPO is still an uncertain: FPO leader Heinz-Christian Strache has accused Kurz and OVP of stealing his party's ideas during the election. All in, almost 60 percent of Austrian voters opted to support anti-immigrant, Right-of-Centre positions. However, in recent years, Austrian Right has shifted away from anti-EU positioning, at least in public, and attempted to shed neo-Nazi tint to its support base. Turnout in this election was impressive 79.3 percent, up on the 74.9 percent turnout last time around. All in, Austrian election 2017 confirms the points established in our recent paper Corbet, Shaen and Gurdgiev, Constantin, Millennials’ Support for Liberal Democracy Is Failing: A Deep Uncertainty Perspective (August 7, 2017). Available for free at SSRN: https://ssrn.com/abstract=3033949. Together with Brexit, renewed uncertainty around Italian political shifts, Catalan Referendum, resilience of the Dutch euroscepticism, instability in core political strata in Germany, Polish and Hungarian populism, and so on - the developing trend across the EU is for a political / voter support drifting further to the extremes (Left and Right) of the ideological divide. 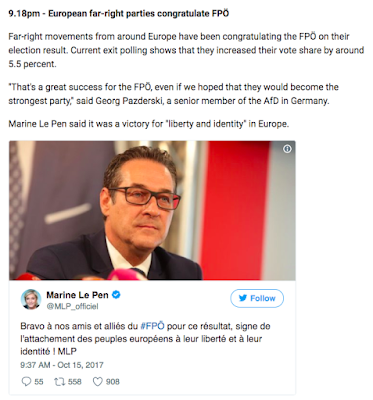 In countries where this drift is coincident with rising power of populism, the results are starting to look more and more like validation of the far-Right (and with some time, the far-Left) as the leaders of the official opposition to the increasingly hollowed-out status quo parties. "Only 4 percent of all publicly traded stocks account for all of the net wealth earned by investors in the stock market since 1926, he has found. A mere 30 stocks account for 30 percent of the net wealth generated by stocks in that long period, and 50 stocks account for 40 percent of the net wealth. Let that sink in a moment: Only one in 25 companies are responsible for all stock market gains. The other 24 of 25 stocks -- that’s 96 percent -- are essentially worthless ballast." Concentration risk: This an obvious one. In today's markets, returns are exceptionally concentrated within just a handful of stocks. Which puts the argument in favour of diversification through a test. Traditionally, we think of diversification as a long-term protection against risks of markets decline. But it can also be seen as coming at a cost of foregone returns. Think of holding 96 stocks that have zero returns against four stocks that yield high returns, and at the same time weighing these holdings in return-neutral fashion, e.g. by their market capitalization. Strategic approaches to capturing growth drivers in your portfolio: There are, as Ritholtz notes, two: exclusivity (active winners picking) and exclusivity (passive market indexing). Which also rounds off to diversification. Behavioral drivers matter: Behavioral biases can wreck havoc with both selecting and holding 'winners-geared' portfolios (as noted by Rithholtz's discussion of exclusivity approach). But inclusivity or indexing is also biases -prone, although Ritholtz does not dig deeper into that. In reality, the two approaches are almost symmetric in behavioral biases impacts. Worse, as proliferation of index-based ETFs marches on, the two approaches to investment are becoming practically indistinguishable. In pursuit of alpha, investors are increasingly being caught in chasing more specialist ETFs (index-based funds), just as they were before caught in a pursuit of more concentrated holdings of individual 'winners' shares. Statistically, markets are neither homoscedastic nor Gaussian: In most cases, there are deeper layers of statistical meaning to returns than simple "Book Profit" or "Stop-loss" heuristics can support. Which is not just a behavioral constraint, but a more fundamental point about visibility of investment returns. As Ritholtz correctly notes, long-term absolute winners do change. But that change is not gradual, even if time horizons for it can be glacial. All of these points is something we cover in our Investment Theory class and Applied Investment and Trading course, and some parts we also touch upon in the Risk and Resilience course. Point 4 relates to what we do, briefly, discuss in Business Statistics class. So it is quite nice to have all of these important issues touched upon in a single article. 14/10/17: Bitcoin's Rise: Bentleys in Vancouver? 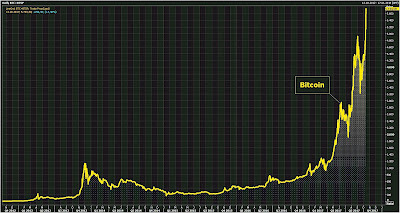 All of which should make you pause and wonder: what fundamentals, if any, can account for the rise of Bitcoin - a question that many tried to answer and few succeeded. As a disclaimer, I have a couple of papers forthcoming on this in the next month or so. And as a taster for the disclaimer, both papers show absolutely no fundamental drivers capable of explaining the rise of Bitcoin from its first day of trading through the end of 1H 2017. The dynamics of Bitcoin are pure memory (Hurst process) and as such contain no bearing with any real asset in the Universe. Put differently, Bitcoin is a hedge against things that cannot be hedged in the markets, most notably, the risk of state-administered expropriation / capital controls in... err... China. So if you want an asset that can (at a staggering risk-premium and transaction cost) hedge your Shanghai property yields against Beijing's reluctance to allow you offshore your cash into a Bentley parked in Vancouver, be my guest. If you have no such need, why, sit back and enjoy the wild ride and gyrations of the crypto to USD/BTC 6,000 and beyond... you can do the latter by playing some Russian roulette speculating on BTC, but do avoid becoming a hostage to St. Petersburg Paradox, should a correction pop the frothy top here and there. 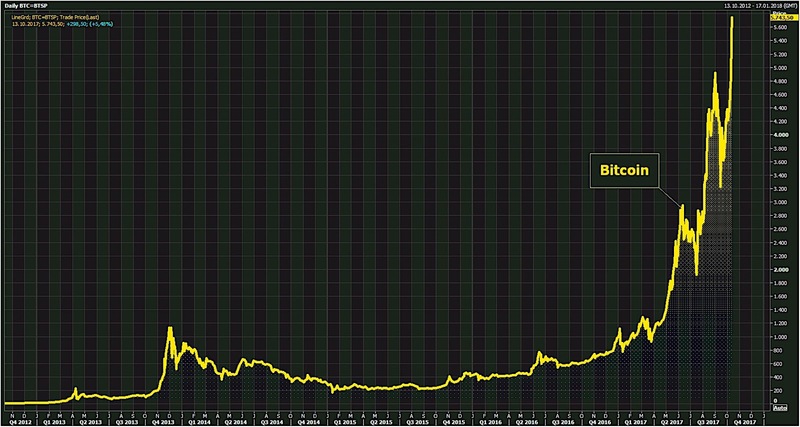 In other words, should you want to speculate on Bitcoin, by all means - do. But mind the tremendous risks. Stay tuned for the aforementioned research papers coming soon. 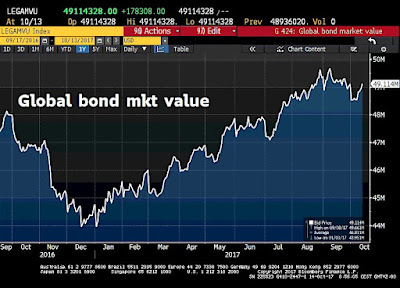 In simple terms, combined value of bond and stock markets is currently at around USD137 trillion or 179% of global GDP. 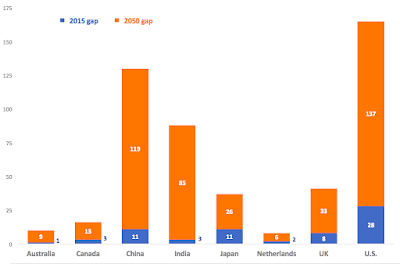 Put slightly differently, that is 263% of global private sector GDP. There is no rational model on Earth that can explain these valuations. Since the start of this year, the two markets gained roughly USD15 trillion in value, just as the global economy is now forecast to gain USD3.93 trillion in GDP over the full year 2017. 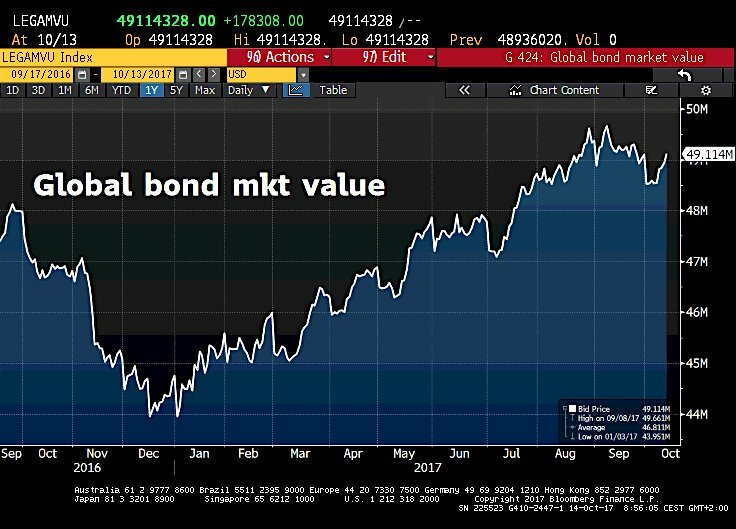 Based on the latest IMF forecasts, the first 9.5 months of stock markets and bonds markets appreciation are equivalent to to total global GDP growth for 2017, 2018, 2019 and a quarter of 2020. That is: nine and a half months of 'no bubbles anywhere' financial growth add up to thirty nine months of real economic activity. Just back from Ireland, a fast, work-filled trip, with some amazing meetings and discussions, largely unrelated to what is in the 'official' newsflow. Some blogposts and articles ahead to be shared. One thing that jumps out is the continued frenzy in building activity in Dublin, predominantly (exclusively) in the commercial space (offices). Not much finished. Lots being built. For now, Irish builders (mostly strange new players backed by vultures and private equity) are still in the stage where buildings shells are being erected. The cheap stage of construction. Very few are entering the fit-out stages - the costly, skills-intensive works stage. And according to several sector specialists I spoke to, not many fit-out crews are in the market, as skilled builders have not been returning to the island, yet, from their exiles to the U.S., Canada, Australia, UAE, and further afield. Which should make for a very interesting period ahead: with so many construction sites nearing the fit-out stages, building costs will sky rocket, just as supply glut of new offices will start hitting the letting markets. In the mean time, many multinationals - aka the only clients worth signing - have already signed leases and/or bought own buildings on the cheap. Google owns its own real estate (hello BEPS tax reforms that stress tangible activity over imaginary revenue shifting); Twitter has a refurbished home; Facebook is quite committed to a lease (although it too might take a jump into buying); and so on. Tax inversion have slowed down and Trump Administration just re-committed to Obama-era restrictions on these, while Trump tax plan aims to take a massive chunk out of this pie away from Ireland. So demand... demand is nowhere to be seen. Will this spell a twin squeeze on office blocks currently hanging around in a pre-weather tight conditions? The glut of debt continues to rise through 2017, albeit at a slightly slower rate than in 2016. These points suggest that, barring a new miracle of monetary variety, forward debt financed investment and growth is bound to slow. And the cost of debt carry is bound to rise. 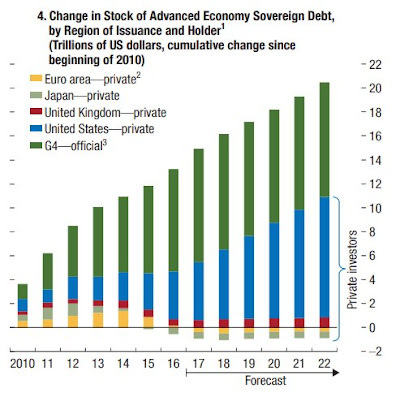 Which should be bad news for the European and U.S. debt-funded real estate activity. And it will be an even tougher pill to swallow for the crop of new (Nama-linked) Irish developers who were quick in raising hundreds of millions in funding in form of cheap (ultra cheap) debt and frothy equity. Many of these lads have nearly zero experience in building, some are backed by 'experts' from Nama's top cohorts of 'specialists' - the cohorts that were dominated by the pre-bust advisers, not developers. The bust is still unlikely at this stage, as majority of current sites that are in mid-stage development have a low acquisition cost, thanks to the fire sales by Nama, and still enjoy a couple of years of cheap debt carry costs. But inflation in construction costs will sap whatever wind the housing building sub-sector might have had in it (which is not much, as housing construction is still sitting well behind offices activity). 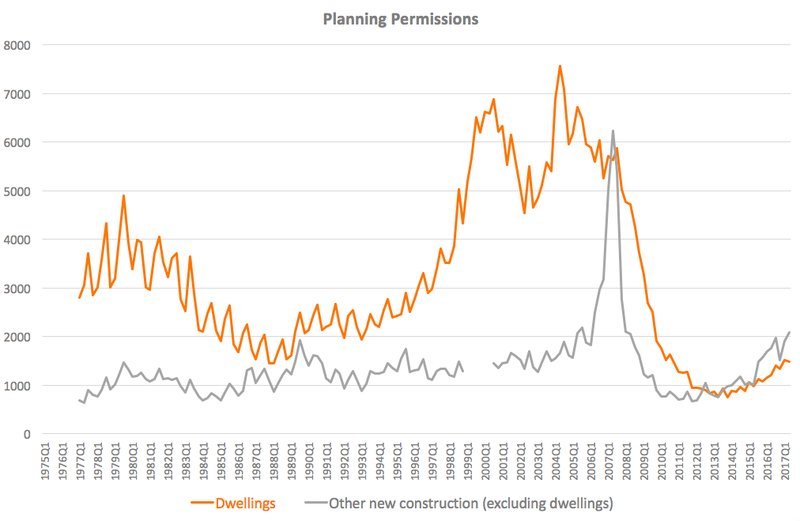 Planning permissions for new housing are languishing sub 1,500 per quarter, comparable to 2010 levels. 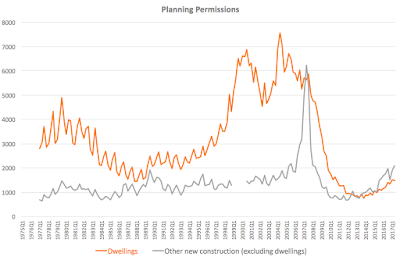 Planning permissions for ex-residential are at late 2007- early 2008 levels, aka stronger. Commercial development sector will continue pressuring house building, driving up rents and residential property prices. The key here is an example of the link between the our human (behavioral) propensity to take action and the dynamic nature of the tail risks or, put more precisely, deeper uncertainty (as I put in my paper on the de-democratization trend https://papers.ssrn.com/sol3/papers.cfm?abstract_id=2993535, the deeper uncertainty as contrasted by the Knightian uncertainty). Deeper uncertainty involves a dynamic view of the uncertain environment in which potential tail events evolve before becoming a quantifiable and forecastable risks. This environment is different from the classical Knightian uncertainty in so far as evolution of these events is not predictable and can be set against perceptions or expectations that these events can be prevented, while at the same time providing no historical or empirical basis for assessment of actual underlying probabilities of such events. In this setting, as opposed to Knightian set up with partially predictable and forecastable uncertainty, behavioral biases (e.g. confirmation bias, overconfidence, herding, framing, base rate neglect, etc) apply. These biases alter our perception of evolutionary dynamics of uncertain events and thus create a referencing point of ‘odds’ of an event taking place. The ‘odds’ view evolves over time as new information arrives, but the ‘odds’ do not become probabilistically defined until very late in the game. - Similarity - the extent to which our behavioral biases distort our assessment of the dynamics. Knightian uncertainty is a simple, one-shot, non-dynamic tail risk. As such, it is similar both in terms of perceived degree of uncertainty (‘odds’) and the actual underlying uncertainty. Now, materially, the outrun of these dimensions of deeper uncertainty is that in a centralized decision-making setting, e.g. in Pentagon or in a broader setting of the Government agencies, we only take action ex post transition from uncertainty into risk. The bureaucracy’s reliance on ‘expert opinions’ to assess the uncertain environment only acts to reinforce some of the biases listed above. Experts generally do not deal with uncertainty, but are, instead, conditioned to deal with risks. There is zero weight given by experts to uncertainty, until such a moment when the uncertain events become visible on the horizon, or when ‘the odds of an event change’, just as the story told by Andrew Hunter in the Quartz article linked above says. Or in other words, once risk assessment of uncertainty becomes feasible. 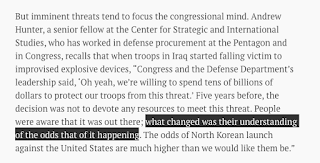 The problem with this is that by that time, reacting to the risk can be infeasible or even irrelevant, because the speed and proximity of the shock has been growing along with its impact during the deeper uncertainty stage. And, more fundamentally, because the nature of underlying uncertainty has changed as well. Take North Korea: current state of uncertainty in North Korea’s evolving path toward fully-developed nuclear and thermonuclear capabilities is about the extent to which North Korea is going to be willing to use its nukes. Yet, the risk assessment framework - including across a range of expert viewpoints - is about the evolution of the nuclear capabilities themselves. The train of uncertainty has left the station. But the ticket holders to policy formation are still standing on the platform, debating how North Korea can be stopped from expanding nuclear arsenal. Yes, the risks of a fully-armed North Korea are now fully visible. They are no longer in the realm of uncertainty as the ‘odds’ of nuclear arsenal have become fully exposed. But dealing with these risks is no longer material to the future, which is shaped by a new level of visible ‘odds’ concerning how far North Korea will be willing to go with its arsenal use in geopolitical positioning. Worse, beyond this, there is a deeper uncertainty that is not yet in the domain of visible ‘odds’ - the uncertainty as to the future of the Korean Peninsula and the broader region that involves much more significant players: China and Russia vs Japan and the U.S. The lesson here is that a centralized system of analysis and decision-making, e.g. the Deep State, to which we have devolved the power to create ‘true’ models of geopolitical realities is failing. Not because it is populated with non-experts or is under-resourced, but because it is Knightian in nature - dominated by experts and centralized. A decentralized system of risk management is more likely to provide a broader coverage of deeper uncertainty not because its can ‘see deeper’, but because competing for targets or objectives, it can ‘see wider’, or cover more risk and uncertainty sources before the ‘odds’ become significant enough to allow for actual risk modelling. Take the story told by Andrew Hunter, which relates to the Pentagon procurement of the Joint Light Tactical Vehicle (JLTV) as a replacement for a faulty Humvee, exposed as inadequate by the events in Iraq and Afghanistan. The monopoly contracting nature of Pentagon procurement meant that until Pentagon was publicly shown as being incapable of providing sufficient protection of the U.S. troops, no one in the market was monitoring the uncertainties surrounding the Humvee performance and adequacy in the light of rapidly evolving threats. If Pentagon’s procurement was more distributed, less centralized, alternative vehicles could have been designed and produced - and also shown to be superior to Humvee - under other supply contracts, much earlier, and in fact before the experts-procured Humvees cost thousands of American lives. There is a basic, fundamental failure in our centralized public decision making bodies - the failure that combines inability to think beyond the confines of quantifiable risks and inability to actively embrace the world of VUCA, the world that requires active engagement of contrarians in not only risk assessment, but in decision making. That this failure is being exposed in the case of North Korea, geopolitics and Pentagon procurement is only the tip of the iceberg. The real bulk of challenges relating to this modus operandi of our decision-making bodies rests in much more prevalent and better distributed threats, e.g. cybersecurity and terrorism. 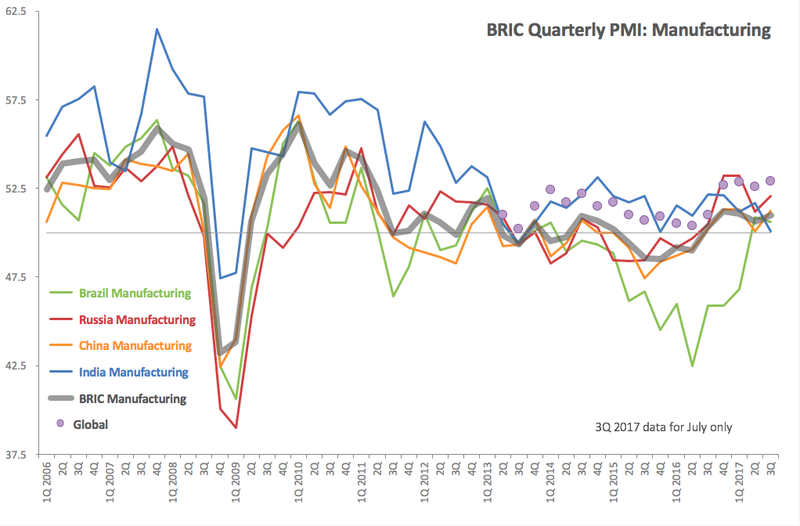 Two posts above cover Manufacturing PMIs and Services PMIs for 3Q 2017 for BRIC economies. The following updates Composite PMIs performance. Global Composite PMI came in at 53.7 in 3Q 2017, matching exactly 1Q and 2Q 2017 readings and basically in line with 53.6 reading in 4Q 2016. In other words, Global Composite activity PMI index has been showing relatively robust growth across the two key sectors for the last 4 quarters running. In contrast to Global indicator, BRIC economies posted relatively underwhelming performance with exception of Russia. Brazil Composite PMI index stood at 50.0 (zero growth) in 3Q 2017, which is a marginal gain on 49.8 in 2Q 2017. This marks the first time since 1Q 2014 that Brazil Composite indicator reached above the outright contraction levels, but it is a disappointing reading nonetheless. For one, one quarter does not signal stabilisation in Latin America’s largest economy. Worse, Brazil’s economy has been performing poorly since as far back as 2H 2011. It will take Brazil’s Composite index to hit above 52 mark for 2-3 consecutive quarters to start showing pre-2011 levels of activity again. Russia Composite PMI, on the other hand, remains the bright spark in the BRIC’s dark growth universe. Although falling to 4 quarters low of 54.1 in 3Q 2017, the index remains in strong growth territory. 3Q 2017 marked 6th consecutive quarter of robust post-recession recovery, consistent with 2.5-3 percent growth in GDP, quite ahead of the consensus forecasts from the start of 2017. The last quarter also marks the sixth consecutive quarter of Russian Composite PMIs running above Global Composite PMIs. This means that for the last 18 months, Russia has been the only positive contributor to Global growth from amongst the ranks of the BRIC economies. China Composite PMI firmed up in 3Q 2017, rising to 51.9 from 51.3 in 2Q 2017. 3Q 2017 reading was, however, the second weakest in the last four quarters and suggests relative weakness in the growth environment. India composite PMI fell below 50.0 mark in 3Q 2017, reaching 48.7 - a level signifying statistically significant contraction in the economy for the first time since 4Q 2013. The robust recovery in 2Q 2017 put India Composite PMI at 52.2, but this now appears to be a blip on the radar which shows anaemic growth in 4Q 2016 and 1Q 2017. As chart above clearly shows, the growth dynamics as indicated by the Composite PMIs have been weak in the BRIC economies over the last 4 consecutive quarters. This is highly disappointing, considering that 4Q 2016 held a promise of more robust expansion. Russian growth conditions have now outperformed Global growth dynamics in every quarter since 2Q 2016, although the latest reading for PMIs suggests that this momentum has weekend in 3Q 2017. In fact, Russian data is quite surprising overall, showing growth conditions largely in line with pre-2009 levels since 4Q 2016. This is yet to be matched by the GDP figures, suggesting that something might be amiss in the PMI data. 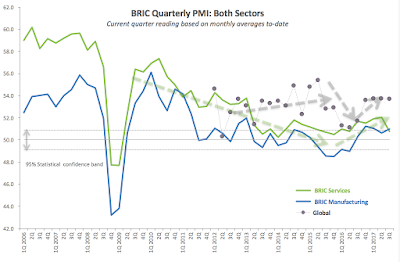 Finally, the chart above shows sectoral dynamics for BRIC group of economies in terms of PMI indices. 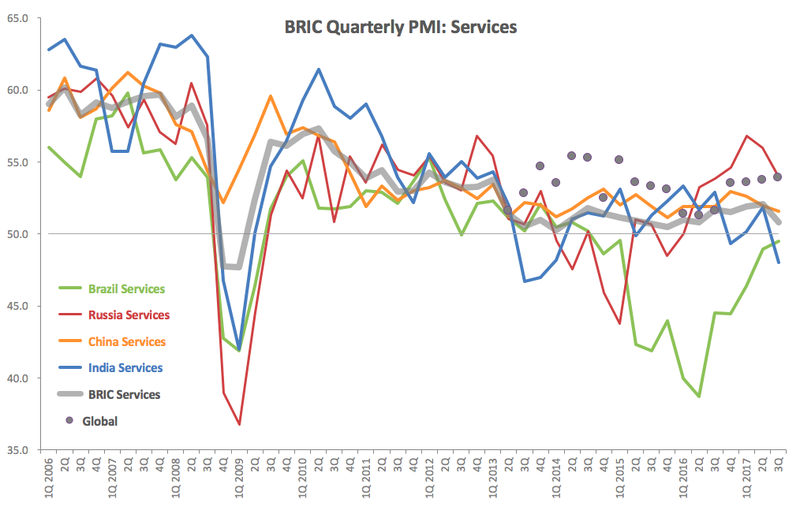 Both Services and Manufacturing PMIs for BRIC grouping are now running close to or below statistical significance levels for positive growth. 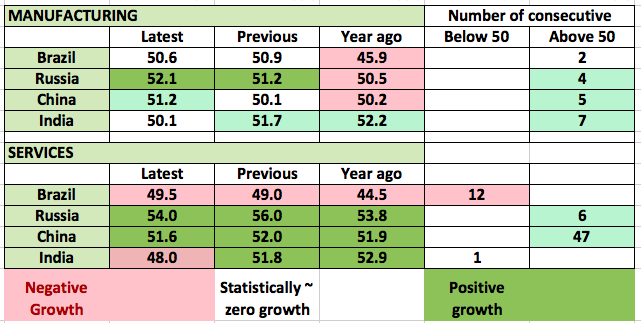 More importantly, on-trend, current performance remains within the bounds of growth consistent with H2 2013-present trend: shallow, close to statistically insignificant expansion, that is distinct from robust growth in pre-2008-2009 period and the short period of post 2009 recovery. 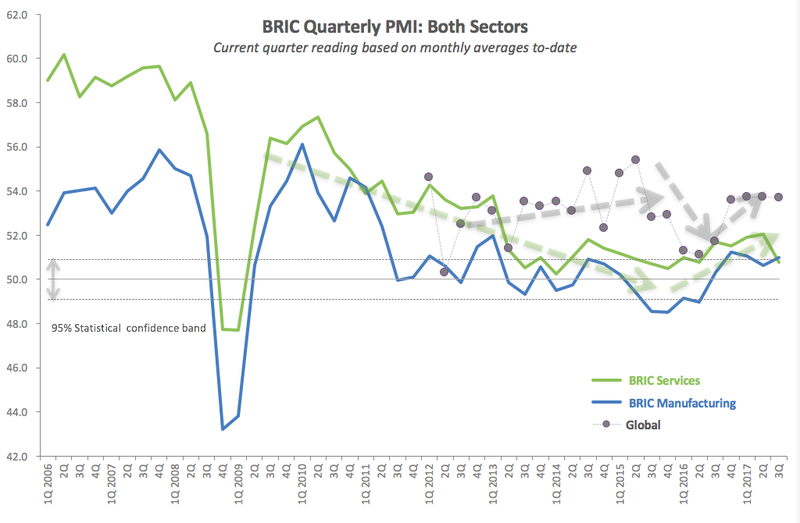 Thus, PMI data still indicates that BRIC economies currently no longer act as the key drivers of global growth. Having covered 3Q 2017 figures for BRIC Manufacturing PMIs in the previous post, let’s update the same for Services sector. Brazil Services PMI remained below 50.0 mark for the 12th consecutive quarter, rising marginally to 49.5 in 3Q 2017 from 49.0 in 2Q 2017. Current reading matches 1Q 2015 for the highest levels since 1Q 2014. Statistically, Brazil Services PMI has been at zero or lower growth since 1Q 2014. Russia Services PMI fell to 54.0 in 3Q 2017 from 56.0 in 2Q 2017 and 56.8 in 1Q 2017, indicating some cooling off in otherwise rapid expansion dynamics. The recovery in Russian Services sectors is now 6 quarters long and overall very robust. China Services PMI decline marginally from 52.0 in 2Q 2017 to 51.6 in 3Q 2017. This is consistent with trend established from the local peak performance in 4Q 2016. Overall, Chinese Services are showing signs of persistent weakness, with growth indicator falling below statistically significant reading once again in 3Q 2017. India Services sector has been a major disappointment amongst the BRIC economies, with Services PMI falling from 51.8 in 2Q 2017 to a recessionary 48.0 in 3Q 2017. The Services PMIs for the country have been rather volatile in recent quarters, as the economy has lost any sense of trend since around 4Q 2016. With Global Services PMI remaining virtually unchanged (at 53.9) in 3Q 2017 compared to 2Q 2017 (51.8), with marginal gains on 1Q 2017 (53.6) and 4Q 2016 (53.5), the BRIC Services sectors are showing no signs of leading global growth to the upside since 3Q 2016. For the sixth consecutive quarter, Russia leads BRIC Services PMIs, while Brazil and India compete for being the slowest growth economies in the services sectors within the group. As with Manufacturing, BRIC Services sectors show no signs of returning to their pre-2009 position of being the engines for global growth. 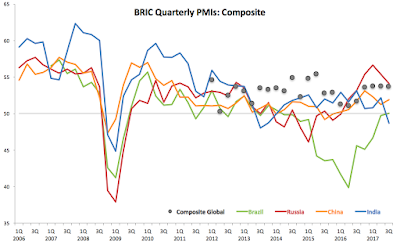 Stay tuned for Composite PMIs analysis for BRIC economies. With Markit Economics finally releasing China data for Services and Composite PMIs, it is time to update 3Q figures for Manufacturing and Services sectors PMI indicators for BRIC economies. As shown above, Manufacturing PMIs across the BRIC economies trended lower over 3Q 2017 in Brazil and India, when compared to 2Q 2017, while trending higher in Russia and China. Brazil posted second lowest performance for the sector in the BRIC group, barely managing to stay above the nominal 50.0 mark that defines the boundary between growth and contraction in the sector activity. Statistically, 50.6 reading posted in 3Q 2017 was not statistically different from 50.0 zero growth. And it represents a weakening in the sector recovery compared to 50.9 reading in 2Q 2017. Brazil's Manufacturing sector has now been statistically at zero or negative growth for 18 quarters in a row. Meanwhile, Russian Manufacturing PMI rose from 51.2 in 2Q 2017 to 52.1 in 3Q 2017, marking fifth consecutive quarter of expansion in the sector (nominally) and fourth consecutive quarter of above 50.0 (statistically). With this, Russia is now back at the top of Manufacturing sector growth league amongst the BRIC economies. However, 3Q 2017 reading was weaker than 4Q 2016 and 1Q 2017, suggesting that the post-recession recovery is not gaining speed. China Manufacturing PMI rose in 3Q 2017 to 51.2 from zero growth of 50.1 in 2Q 2017. The dynamics are weaker than in Russia, but similar in pattern, with 3Q growth being anaemic. In general, since moving above 50.0 mark in 3Q 2016, China Manufacturing PMIs never once rose above 51.3 marker, indicating very weak growth conditions in the sector. India's Manufacturing PMI tanked again in 3Q 2017 falling to 50.1 (statistically - zero growth) from 51.7 in 2Q 2017. Most recent peak in Manufacturing activity in India was back in 3Q 2016 and 4Q 2016 at 52.2 and 52.1 and these highs have not been regained since then. India's economy continues to suffer from extremely poor macroeconomic policies adopted by the country in recent years, including botched tax reforms and horrendous experimentation with 'cashless society' ideas. 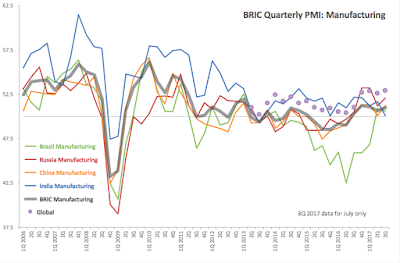 Overall, BRIC Manufacturing Index (computed using my methodology on the basis of Markit data) has risen to 51.0 in 3Q 2017 on foot of improved performance in Russia and China, up from 50.6 in 2Q 2017 and virtually matching 51.1 reading in 1Q 2017. At 51.0, the index barely exceed statistical significance bound of 50.9. This runs against the Global Manufacturing PMI of 52.9 in 3Q 2017, 52.6 in 2Q 2017 and 52.9 in 1Q 2017. In simple terms, the last quarter was yet another (18th consecutive) of BRIC Manufacturing PMI falling below Global Manufacturing PMI, highlighting a simple fact that world's largest emerging and middle-income economies are no longer serving as an engine for global growth. Stay tuned for Services PMIs analysis. Last month, I wrote an editorial for @MarketWatch on the declining fortunes of the American wage earners. And this week, the BLS released new data on wage growth in the U.S. economy. The new numbers are 'shiny'. This is a great print. Except, it really is not all that exciting, when one reaches below the surface. September 2017 wage increases are still below 2008-2009 averages for all wage earners, except for low-wage industries. 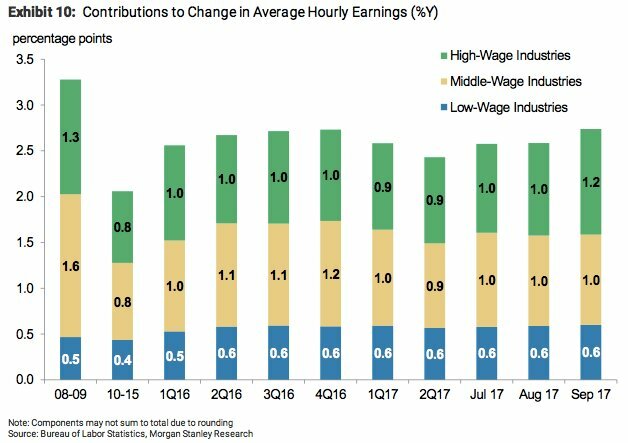 The gains 'break out' drivers are in high-wage industries, where growth has risen 20% compared to much of the 2016-present trend. Overall, growth rate is well below 2008-2009 average of 3.4%. 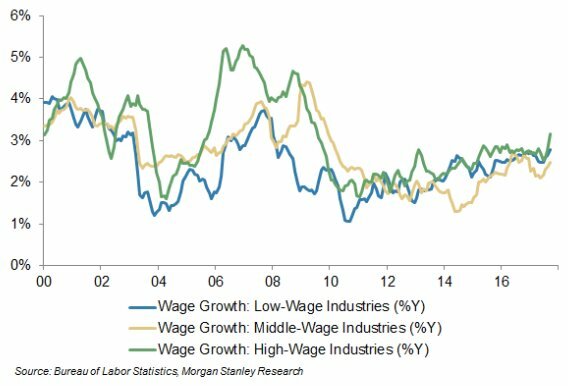 Low-wage industries wages inflation is running close to pre-crisis average, since roughly the start of 2017. Good news. High and meddle-wage industries wages inflation is running below the pre-crisis average still. We have had roughly 8 years in the current trends, meaning that a large cohort of current workers have entered the workforce with little past gains in wages under their belt. This means a very brutal and simple arithmetic: many workers in today's economy have never experienced the gains of pre-crisis magnitudes. Wage increases are cumulative or compound in nature. Wage increases slowdown is also cumulative or compound in nature. Hence, workers who entered the workforce from around 2004 onwards have had shallower cumulative gains in wages than workers that preceded them. Guess what else do the former workers have that differentiates them from the latter? Why, yes: 1) higher student debt; 2) higher rent costs; 3) greater risk- and age-adjusted health insurance costs, and so on. 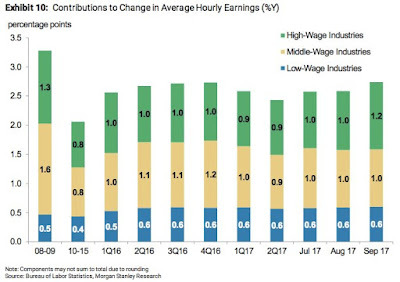 In other words, for the later cohorts of workers currently in the workforce, lower wages increases came at a time of rampant increases in non-discretionary spending costs hikes. To say that today's BLS wage inflation print is great news is to ignore these simple facts of economics: to restore wages to pre-crisis trends - the trends that would allow for the return of the Millennial generation to pre-crisis expectations (or to the cross-generational income and wealth growth patterns of previous decades), we need wages growth rates at 5-percent-plus not in one or two or three months, but in years ahead. The 2.9% one month blip in data is not the great news. It might be a good news piece, but it is hardly impressive or convincing. And that figure of 5%-plus hides yet another iceberg, big enough to sink the Titanic: given that the Millennials are carrying huge debts and are delaying household formation in record numbers, 5%-plus wage inflation will also hit them hard through higher interest rates and higher cost of debt carry. This puts your average news headline relating to 2.9% annual increase in wages September figure into a correct, life-cycle perspective. 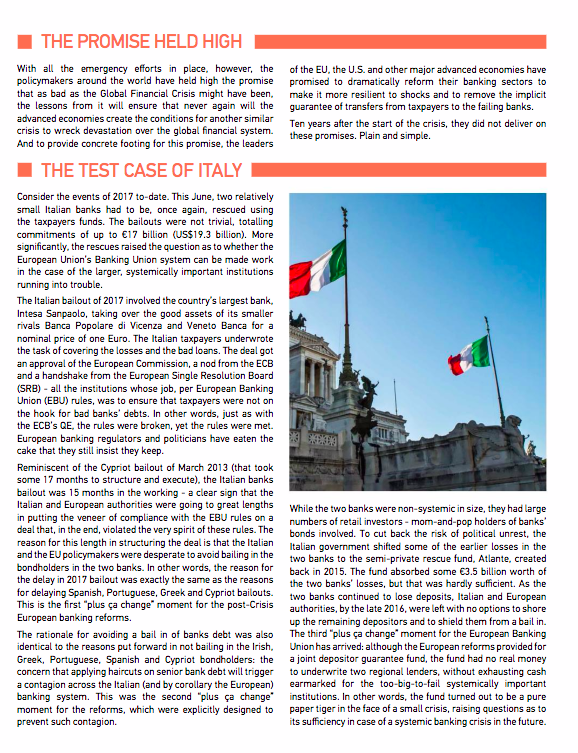 6/10/17: Italian Banks Tested EU Banking Reform. It Failed. 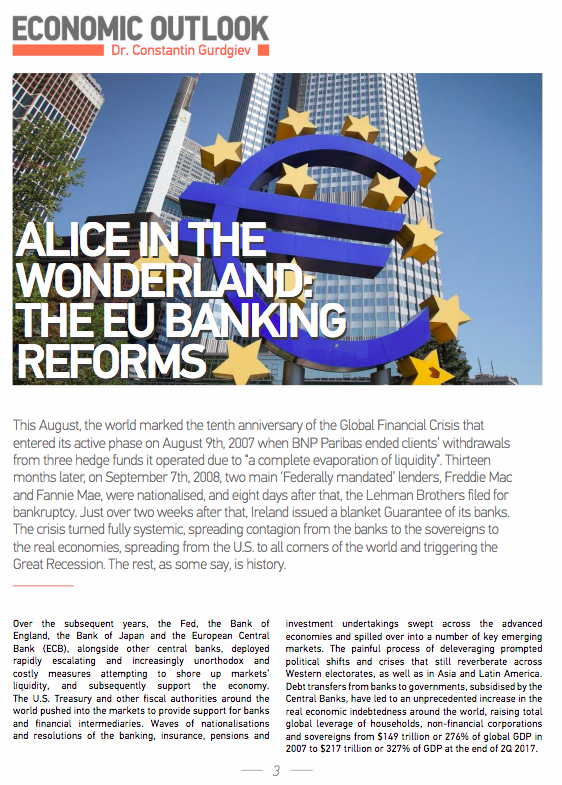 My article on the patent failures in the EU Banking Crisis resolution reforms exposed by the 2017 events surrounding Italian banking sector is out via @ManningFinancial http://issuu.com/publicationire/docs/mf_autumn_2017?e=16572344/54030271. Occasionally, the Irish Comptroller and Auditor General (C&AG) office produces some remarkable, in their honesty, and the extent of their disclosures, reports. Last month gave us one of those moment. There are three key findings by CA&G worth highlighting. 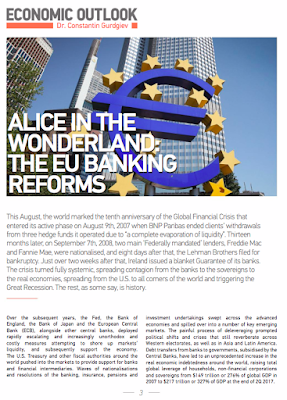 Irish banking crisis was enabled by the combination of a property bubble that was co-founded by tax optimisation running rampant across Irish economic development model since the 1990s; and by loose money / capital flows within the EU, which was part and parcel of our membership in the euro area. The same membership supported our FDI-focused competitive advantage. 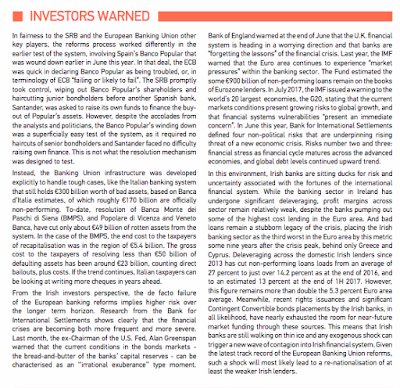 Irish recovery from the banking crisis was largely down to non-domestic factors, aka - tax optimisation-driven FDI and foreign companies activities, plus the loose money / capital flows within the EU enabled by the ECB. In a way, as Ireland paid a hefty price for European imbalances and own tax-driven economic development model in 2007-2012, so it is paying a price today for the same imbalances and the same development model-led recovery. Let’s take the CA&G report through a summary and some comments. 1) Framing CA&G analysis, we had a recent study by World Bank and PwC that estimated Ireland’s effective rate of corporation tax at 12.4%, just 0.1 per cent below the statutory or headline rate of 12.5%. To put this into perspective, if 12.4% effective rate holds, Ireland is not the lowest tax jurisdiction in the OECD, as 12 OECD economies had an effective rate below 12.4% and 21 had an effective rate of corporation tax above 12.4%. For the record, based on 2015 data, France had the 2nd-highest statutory rate at 38% but the lowest effective rate at just 0.4%. I contrast, the U.S. had the highest statutory tax rate at 39% and the second highest effective rate at 28.1%. There is a lot of fog around Irish effective corporate tax rates, but CA&G The C&AG found that the top 100 in taxable income terms companies had a an average effective corporation tax rate at 9.3%, slightly less than the rate applying to all companies (9.8%). The CA&G findings show some dramatic variation in the effective tax rates paid by the Ireland-based corporations. CA&G report is based on a set of top 100 companies trading from Ireland. Of these, 79 companies paid an effective corporate tax rate of 10-15 percent, and almost 2/3rds paid a rate of 12% and higher. However, 13 companies faced a tax rate of under 1 percent. Irish corporate tax system is risk-loaded: per CA&G report, 37% of all corporate tax receipts collected by the Irish Exchequer come from just 10 companies, while top 100 firms supply 70% of total corporate tax receipts. This concentration is coincident with rising reliance of the Exchequer on corporate tax collections, as corporation tax contributions to the State rose 49% in 2015 to reach EUR6.9 billion. The Leprechaun Economics that triggered a massive transfer of foreign assets into Ireland in 2015-2016 has pushed corporate tax receipts to account for 15% of the total tax revenues. Worse, 70% of total corporate tax take in Ireland came from only three sectors: finance, manufacturing and ICT. Manufacturing, of course, includes pharma sector and biopharma, while ICT is dominated by services, like Google, Facebook, Airbnb et al. This reliance on corporate tax revenues is the 6th highest in the OECD, based on 2015 figures. Per CA&G report, “Corporation tax receipts are highly concentrated both in terms of sectors and by number of taxpayers”. In other words, the Leprechaun Economics model is wrought with risks of a sudden stop in Exchequer revenues, should global flows of funds and assets into Ireland reverse (e.g. due to EU disruption, such as policy shift or Brexit/geopolitical triggers, or due to the U.S.-led shock, such as radical changes in the U.S. corporate tax regime). The above is worrying. Leprechaun Economics model - or as I suggested years ago, the Curse of Tax Optimisation model - for economic development, chosen by Ireland is not sustainable and it is open to severe risks of exogenous shocks. Such shocks can be sudden and deep. And were risks to the MNCs domiciling into Ireland to materialise, the Exchequer can see double digit deficits virtually over night. 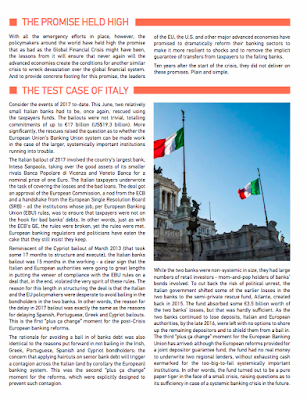 2) CA&G report also attempts to compute the net expected cost of the banking crisis to the country. 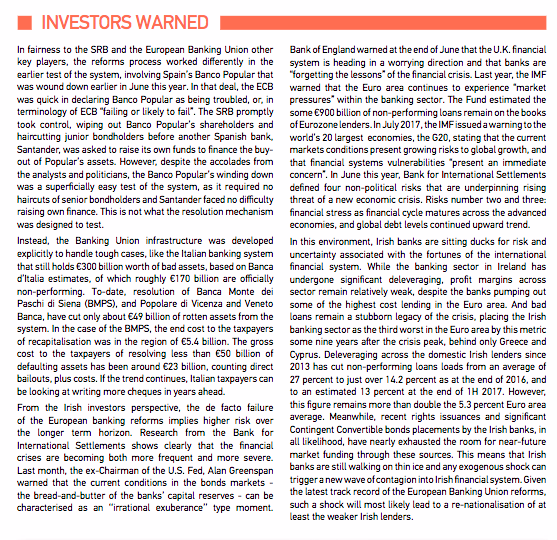 Per report, the expected cost of rescuing the banks stands at around EUR 40 billion as of the end of 2016, while on the long run timing, the cost is expected to be EUR56.4 billion. However, accounting for State assets (banks’ shares), Nama ‘surpluses’ and other receipts, the long term net cost falls just below EUR40 billion. At the end of 2016, per CA&G, the value of the State's share in AIB was EUR11.6bn, which was prior to the 29% stake sale in an IPO of the bank. 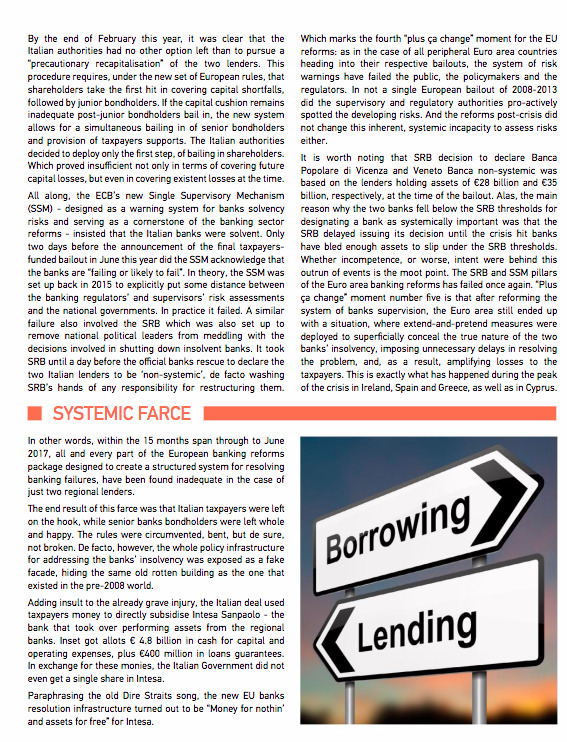 As history tells us, EUR66.8 billion was used to recapitalise the Irish banks with another EUR14.8 billion paid out in debt servicing costs. 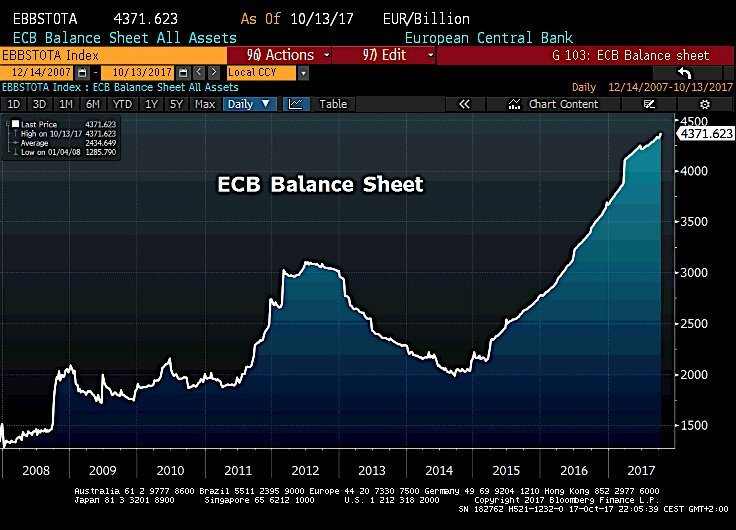 The debt servicing bill currently runs at around EUR1 billion on average, and that is likely to rise dramatically once the ECB starts unwinding its QE which effectively subsidises Irish Exchequer. CA&G report accounted for debt servicing costs in its calculation of the total expected cost of banks bailouts, but it failed to account for the fact that these debt costs are perpetual. Ireland does not retire debt when it retires bonds, but predominantly uses new borrowings to roll over debt. hence, debts incurred from banks recapitalisations are perpetual. CA&G report also fails to a account for the opportunity cost of NPRF funds that were used to refinance Irish banks. NPRF funds generated tangible long term returns that were foregone in the bailout. 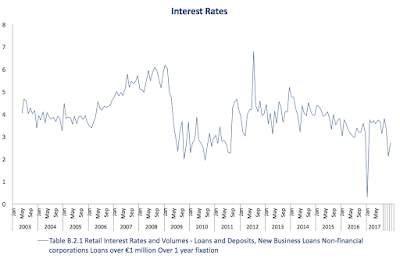 Any economic - as opposed to accounting - analysis of the true costs of Irish banks bailouts must account for opportunity costs and for perpetual debt finance costs. As a reminder, the State still owns remaining investments in AIB (71% shareholding), Bank of Ireland (14%) and Permanent TSB (75%) which CA&G estimated to be worth EUR13.6 billion. One way this might go is up: if recovery is sustained into the next 3-5 years, the state shares will see appreciation in value. The other way it might turn a decline: these are sizeable shareholdings and disposing off them in the markets will trigger hefty discounts on market share prices. CA&G expects Nama to generate a surplus of EUR3 billion. This is uncertain, to put it mildly, because Nama might not window any time soon, but morph instead into something else, e.g. ’social housing developer’ or into a general “development finance’ vehicle - watch their jostling for a role in ‘resolving’ the housing crisis. If it does, the surplus will be forced, most likely, into some sort of a development finance structure and, although recorded on paper, will be used to pay continued Nama wages and costs. In simple terms, the CA&G figure is an accounting underestimate of the true net cost of the bailouts and it is also a gross economic underestimate of the same. 3) As noted above, the third aspect of the CA&G report worth mentioning is the rapid acceleration in Ireland’s overpayment to the EU on foot of the rapid superficial GDP expansion of 2015-2016 period. According to CA&G, Ireland’s contributions to the EU rose to EUR2 billion - up 20% y/y - in 2016. This increase was largely driven by the fake growth in GDP that arises from the multinational companies shifting assets into Ireland for tax purposes. CA&G expects this figure to rise to EUR2.4 billion in 2017. In simple terms, Ireland is overpaying for the EU membership to the tune of EUR1 billion - an overpayment necessitated by the MNCs-induced superficial expansion of the national accounts. This activity has zero impact on the ground, but it induces a real cost on Irish society. Of course, one can as easily make an argument that our beggar-thy-neighbour tax policies are conditional on us being within the EU, so we are paying extra for the privilege of housing all corporate tax optimisers in Ireland. All in, the CA&G report is a solid attempt at making sense of the Kafkaesque economics of the Irish State. That it deserves some critical comments should not subtract from its value and the quality of effort.